May 18, 2018, 2:00 p.m.
Americans worry – about the continued possibility of terrorist attacks on US soil, the seriousness of illegal immigration, potential nuclear threats from North Korea and Iran, and about the economy (though not quite so much as they used to). In the latest Economist/YouGov Poll, less than a third say the country is more safe from a terrorist attack than it was in 2001, and while Republicans are somewhat more likely than Democrats to see the country as safer than before, they are just as worried about the possibility of a terrorist attack in the next 12 months as Democrats are. In fact, there is little partisan difference in those put the odds as greater than one in ten that there will be a major attack in the coming year. Many people are conflicted on how to prevent an attack. By 45% to 28%, Americans think it is possible to extract useful information from torture, but they are divided on whether or not they support its use. Republicans are in favor, Democrats are opposed. 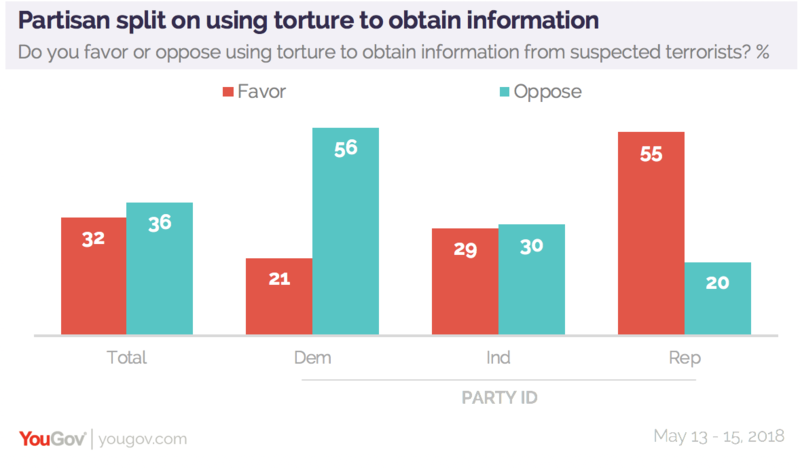 By 43% to 32%, Democrats do not believe torture can produce useful information. Political independents think it can, by a margin of 47% to 27%. Overall, one in five who oppose torture also say it can yield good information. The public approves of this President’s management of terrorism by 42% to 37%, but the divide on the overall use of torture is mirrored in the way Americans view nominating someone to head the Central Intelligence Agency who supports torture (a question that about-to-be confirmed nominee Gina Haspel did not answer directly during her confirmation hearings). Only one in four had heard a great deal about her nomination. 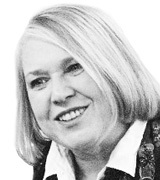 There are disagreements and divisions when it comes to immigration, too. A majority (52%) favors allowing illegal immigrants some path to citizenship, but while that position is taken by seven in ten Democrats, only 28% of Republicans are in favor. 77% of Republicans favor building a wall on the Mexican border, one of President Trump’s major campaign promises, but three in four Democrats oppose it. 61% of Republicans view illegal immigration as a very serious problem in the country, but only 18% of Democrats do. But partisans agree on two ways of managing illegal immigration at the border, though that agreement is negative: they oppose catch and release, a current measure, and oppose family separation, one being proposed now. 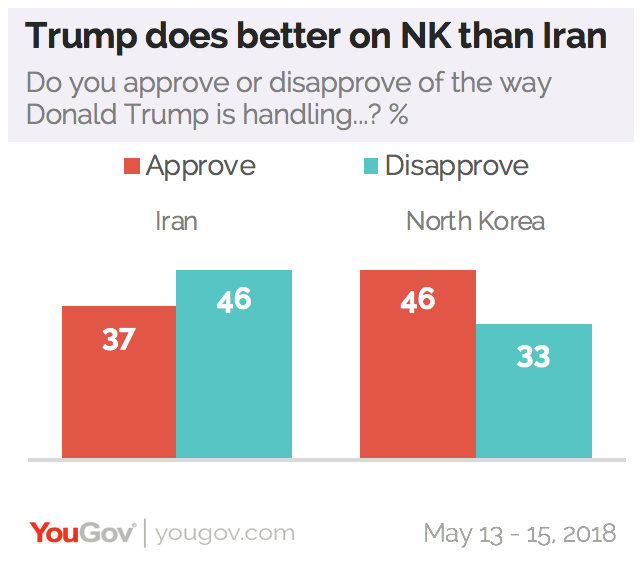 Americans are happy with how the President is handling North Korea – but not with the way he is handling Iran. Within the United States, there is also worry about the use of nuclear power – even to generate electricity. Support for nuclear power plants has declined from what it was in 2011 as Japan’s Fukushima Daichi nuclear plant experienced an earthquake, a tsunami and an internal hydrogen explosion, and is even lower than support for nuclear power plants in an Economist/YouGov poll conducted a month after those events. Then, Americans actually favored constructing more nuclear power plants to generate electricity. Now they are not so sure. And only 28% want them in their own communities. The government is once again confronted by the question of what to do with spent nuclear material from existing US plants. By nearly three to one, the public believes it is better to have just one disposal site for nuclear waste, instead of storing the waste at the plants where it was generated. Currently, the site being discussed in Congress is Yucca Mountain, in Nevada. For most Americans, that would be fine. But the opposition to this legislation coming from Nevadans would come from whatever place was chosen. Only 15% approve of a nuclear waste site in their own community.